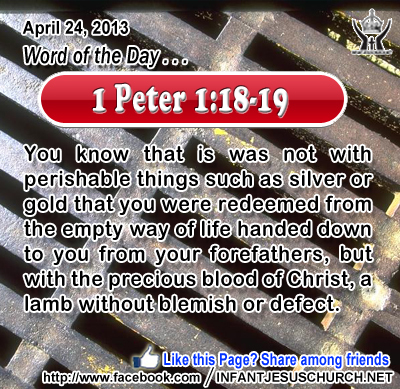 1 Peter 1:18-19: You know that is was not with perishable things such as silver or gold that you were redeemed from the empty way of life handed down to you from your forefathers, but with the precious blood of Christ, a lamb without blemish or defect. Heavenly Father, may we live each more aware of our inestimable value to you. May our words, thoughts and actions be permeated with your sense of our worth - not so that we may seem important to others, but so that we may live in holiness and honor to your precious gift to us. Through Infant Jesus we pray. Amen. 44And Jesus cried out and said, "He who believes in me, believes not in me but in him who sent me. 45 And he who sees me sees him who sent me. 46 I have come as light into the world, that whoever believes in me may not remain in darkness. 47 If any one hears my sayings and does not keep them, I do not judge him; for I did not come to judge the world but to save the world. 48 He who rejects me and does not receive my sayings has a judge; the word that I have spoken will be his judge on the last day. 49 For I have not spoken on my own authority; the Father who sent me has himself given me commandment what to say and what to speak. 50 And I know that his commandment is eternal life. What I say, therefore, I say as the Father has bidden me." God does not desire leave us in spiritual darkness - in our ignorance and unbelief. He is always ready to give us his light, understanding, and truth to all who seek him and who hunger for his word. Through the gift of the Holy Spirit he helps us to grow every and each day in faith, knowledge, and understanding of his life-giving word. Do we want to know more of God and his transforming love? Look to Jesus, the Light of God, and in his truth you will find joy, liberty, and wholeness of mind, body and soul. Loving Infant Jesus, in your word we find life, truth, and freedom. May we never doubt your word nor forget your commandments. Increase our love for your word of truth that we may embrace it fully in our life.